We love being in Ed-Tech. It’s exciting to hear that our product helps students learn. That’s why we started the company. We’ve tried a few different business models and weren’t entirely happy with any of them. Charging for GoSoapBox allows us to generate revenue to pay the bills but creates a barrier for teachers to adopt the product. School budgets are tight and teachers don’t have a ton of disposable income to pay for additional tools. Our ultimate goal is to help as many students learn as possible. Charging for our product gets in the way of that. GoSoapBox would be custom designed / skinned with the partner organization’s logo and branding. IT WOULD BE a well designed, visual branding layout. IT WOULD NOT be a standard banner ad, or text based ad, like something you’d see on Google adwords. We created a very brief survey in order to assess the feasibility of this idea. The data collected from this survey will help us determine the demand for the free product and help in creating usage projections that we can bring to our partner organizations. Please share this with other K-12 folks in your network. The more data the better! This entry was posted in company updates on February 11, 2013 by John Pytel. It’s been just over a year since we opened our Beta for the first time, and it’s amazing for us to look back to where we started, and where we are today. We truly consider our users as part of our team and are so appreciative of all your support. We want to share some of the data and insights that we’ve collected to tell the story of GoSoapBox’s progression through this first year. You’ve all played a part in our journey so we thought it was only right to give you a behind the scenes look at our story. This entry was posted in company updates on October 26, 2012 by John Pytel. 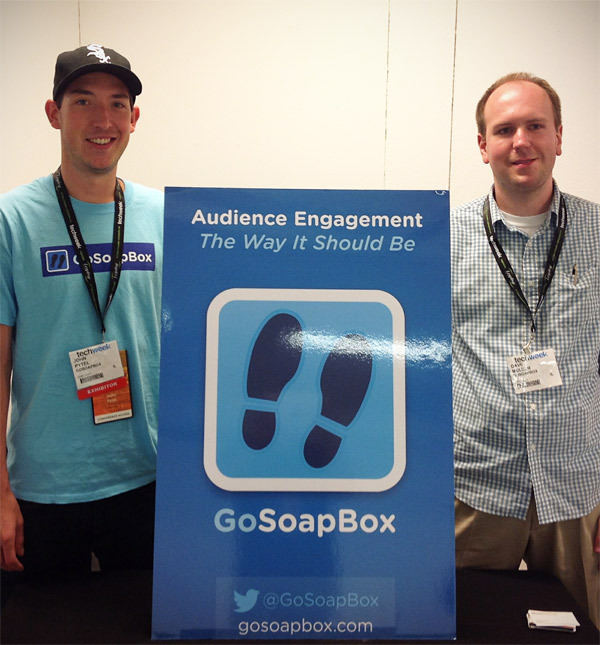 If you were at Techweek 2012 in Chicago, you may have seen the GoSoapBox crew hanging around. We were exhibiting from Friday, June 22 through Monday, June 25, showing off our flagship product to the Windy City’s tech crowd. Techweek was a great fit for us in part because it took place only a few floors away from our office at 1871, but also because it gave us a chance to show off our new GoSoapBox for Conferences offering. Because this was our first time exhibiting GoSoapBox, we waited until the last minute to prepare our booth materials. Naturally, we had to scramble to get our poster ready as well as our handouts. Our setup wasn’t as glamorous as others (hey! we’re bootstrapping here), but we still had a great time meeting a lot of interesting people from Chicago and beyond. This entry was posted in company updates and tagged chicago, techweek on June 27, 2012 by Dave Mulder. Last week, GoSoapBox opened its digital doors to the public. We were featured on Mashable, tweeted on Twitter, and discussed on numerous blogs. Many praised our innovative product, others scoffed. As thrilled as we are to be growing, we are pausing today to address a few concerns and questions. Our public launch included moving to a for-pay service. We have heard from a few teachers that our asking price is too steep. Others were disappointed that the product costs anything. Frankly — we do not like charging for GoSoapBox and wish we could keep it free forever. Budgets are tight in schools, and any new expense is difficult to justify. So why are we charging? We want to build a great product. We want to be accountable to our users, not investors. Revenue allows us to reinvest in GoSoapBox and continue our track record of rapid improvement. It supports us while we work almost nonstop to build and support our product. And unlike most educational startups, especially ones offering free products, we have not taken any outside investment. Our only stakeholders are our users, and we want to keep it that way as long as possible. We developed our price point after conducting numerous interviews with our beta users. We know that we’ll never be able to satisfy everyone at any price, but after speaking with our users we felt that $90 was a reasonable amount to ask for an entire year of use. Through our beta user interviews we also discovered that many teachers would plan to use funds from a school budget in order to pay for the subscription, or get reimbursed for the cost. Our current payments system only accepts credit cards but we are open to accepting other payment formats. Email john@gosoapbox.com and tell us what format works best for you. Though we are not ready to launch an enterprise edition of GoSoapBox, it will be available shortly (along with pricing information). Anyone interested in this should email john@gosoapbox.com. While we have never come across a product that accomplishes exactly what GoSoapBox does, there may be other products that we have yet to discover. What differentiates GoSoapBox from the competitive products that we have discovered is the custom level of engagement that can be achieved, combined with ease of adoption. Clickers and other competitive products focus on teachers engaging students with questions, and while GoSoapBox accomplishes polls & quizzes just as well, it also focuses on students engaging the teacher with questions. It’s nice to see how well students can answer the questions that you ask them, but it’s often times more effective to see the questions that they’re asking you. And unlike many of our competitors, teachers don’t have to re-design their curriculum to best fit GoSoapBox — they can customize GoSoapBox to best fit their style of teaching. This entry was posted in company updates and tagged launch on February 21, 2012 by John Pytel.